Few weeks ago, I got a visit from my sister in law and niece who were visiting from France for a week. On the day of their arrival I decided not to cook anything Frenchie, but UK national dishes: Rice and curry with an apple crumble for dessert. They really enjoyed the meal. I cooked on a hurry and having had a long day at work, I didn’t have the time to take pictures as I went along. Today I made the curry for lunch so I can post it here. The thing is, I don’t like beef, rice or curry. I don’t like the beef because it can be chewy if cooked for more than 10 minutes. And if cooked for less than 10 minutes I feel like there are some gremlins growing in the meat that cannot be killed in less than 10 minutes on the heat. I don’t like curries because of the smell. I don’t like rice because I don’t like it. No reason. So today for lunch I had a dish that I am not fan of, but it tasted up to scratch so, I’d like to invite you to try and cook it. – 3 spoons of sunflower oil. Thinly cut the whole red onion and mix with the strips of beef. Rice the rice with cold water to remove the starch until the water is clear, then pour it in the cooking pot and cover with water (about 3cm above the rice level). Thinly chop a hand full of parsley, then set aside. Method: Place the rice to simmer on high heat. Add 1 spoon of sunflower oil and a pinch of salt. Stir, and leave to simmer uncovered for about 7 minutes until the water evaporates. Stir, put it on very low heat then cover for another 5 minutes. In the meantime, heat the remaining 2 spoons of vegetable oil, then throw in the mix beef and onions. Stir-cook for 5 minutes. When the meat is tender, add the entire jar of curry and the coconut cream. Also add 25ml of water. Stir, adjust the seasoning and cover. Simmer on medium heat for another 10 minutes. It is ready. By this time the rice should have been removed from the cooking plate already. Just before serving, mix the chopped parsley with the rice. If you can, serve the dish with some warmed up naan bread. 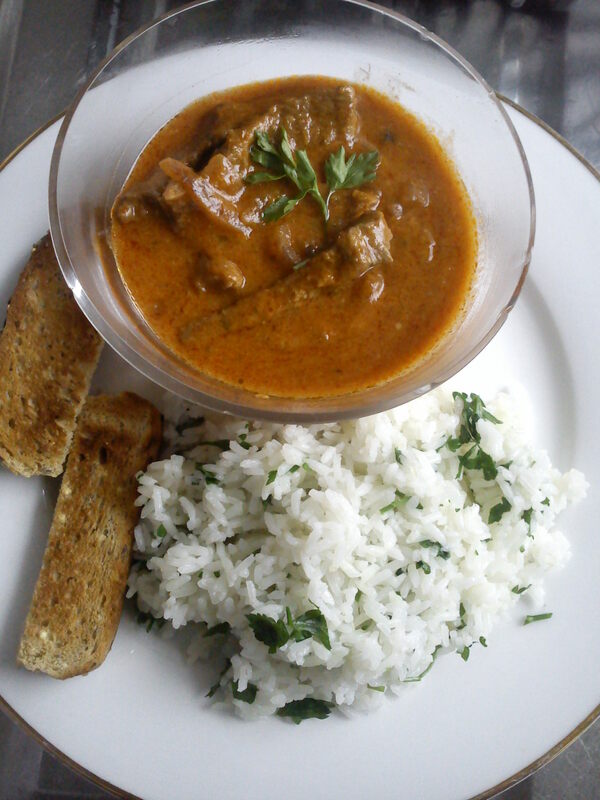 This entry was posted in Main meals and tagged Beef, curry, rice, sunflower oil, Thai. Bookmark the permalink.